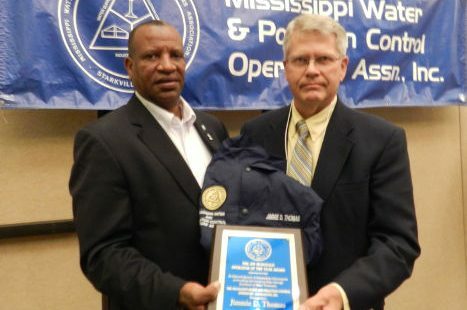 Jimmie Dale Thomas of Lexington has earned the 2017 Jim McDonald Water Supply Operator of the Year for a “Class D” Water System presented by the Mississippi Water and Pollution Control Operator’s Association. MWPCOA President Anthony Hall presented the award at the Association’s Annual Conference in Biloxi, MS on April 18. MWPCOA represents more than 2,500 certified water and wastewater operators in the state. (Photo) cutline: (Left to Right) MWPCOA President Anthony Hall presents the 2017 Jim McDonald Water Supply Operator of the Year Award to Jimmie Dale Thomas of Lexington.